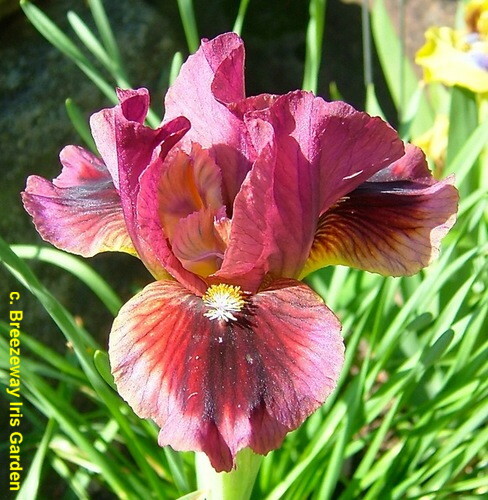 'Reddy Freddie' (Michael Sutton, R. 2011) Seedling# W-778-A. SDB, 10 (25 cm), Early to midseason bloom. Standards and style arms fuchsia purple; falls magnolia purple, cardinal red thumbprint, near black around beards; beards mustard, hairs white tipped mustard; pronounced spicy fragrance. 'Cat's Eye' x 'Under My Thumb'. Sutton 2012.